We are so excited to share some of our favorite gelatin recipes with you. You’ll find some classic ways to use gelatin like our DIY sugar free jello and gummies, but also some unexpected ways to use gelatin in your cooking like Cheesy Biscuits and Chocolate Orange Truffles. All of these gelatin recipes are easy, with an added nutritional boost from the gelatin. So get ready to bake, shake and enjoy these 12 gelatin recipes that you can make with Further Food Premium Gelatin. Gelatin is a lot more than an ingredient that gives foods texture and firmness! Gelatin is a protein-rich powder, derived from collagen, which contains significant amounts of some important amino acids—such as glycine—that have tremendous health benefits for the entire body. Gelatin is the result of the partial hydrolysis of collagen. 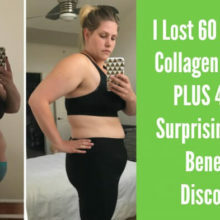 Collagen, the most abundant protein in our bodies, makes up a significant part of our connective tissues and skin. Collagen supplements have become popular because they can help replenish the collagen we naturally lose through aging. SInce gelatin is derived from collagen, a gelatin supplement can provide the same benefits as collagen! Gelatin, like collagen, supports skin hydration and elasticity, healthy hair and nails, overall gut health and bones and joints. Gelatin is actually super easy to use in cooking! To use as a thickener, simply mix one tablespoon into at least two ounces of water and just add it to your recipes. You can add gelatin to smoothies, desserts, soups, stews, gravies and so much more. Not all gelatins are the same. It is important to check the source of your gelatin and make sure that the gelatin you use comes from grass fed, pasture raised beef. Also, make sure there are no other added or unwanted ingredients. Lastly, you should know that not all gelatins have the same taste, or preferably, lack of taste. Further Food Premium Gelatin is sourced from the highest quality grass fed, pasture raised beef. It is non-GMO, antibiotic free, hormone free, sugar free, kosher certified, and paleo and keto friendly. Additionally, Further Food Premium Gelatin is tasteless and can be mixed into a variety of recipes with added gut, joint and skin benefits. This no sugar added 3 ingredient jello recipe is quick and easy to make and so much healthier than anything you can find in the store! This ready-to-go snack recipe includes grass-fed gelatin (which contains no antibiotics or hormones) and no added sugar. The most exciting part of the recipe is that the flavor is up to you! Try it with lemonade, cranberry juice or any other no sugar added juice of your choice. Enjoy this jello as a healthy snack or after dinner as a sugar free treat. This Kombucha Cranberry Jello recipe is the same quick and easy one we mentioned above, but instead of using fruit juice to flavor it, we made this delicious jello with cranberry kombucha! Kombucha is a fermented tea that contains probiotics, and its benefits include immune system and gut health. Needless to say, the gelatin in this recipe, combined with kombucha, makes for a healthy and beneficial snack! All you need is 10 minutes, some sweet strawberries, Further Food Premium Gelatin, a blender and gummy molds in any shape you like… and in just a short time, you’ll have these delicious three-calorie chews! Using really ripe berries should be sufficient to sweeten these gummies naturally, but you can also add some maple syrup or honey for a little added sweetness. Not only are these healthy nuggets perfect for adult snacking, they’re a healthy option for kids as well. Make a big batch of these Strawberry Gummies to have on hand for snacking during the day or for a healthy no sugar treat after dinner. These immune-boosting gummies are perfect when gearing up for flu season, for pre-airplane travel or simply because they’re fat- and carbohydrate-free and they taste delicious! Elderberry, which can help fight inflammation and infection, paired with gelatin, is a tasty combination for wellness! The gelatin in these flavorful gummies gives you a little protein, plus other gut and joint benefits. You’ll love that they are super easy to make and great for everyone in the family! These creamsicle gummies are a delicious and nutritious treat that will satisfy your sweet tooth and nourish your body! The full-fat coconut milk gives them a creamy texture along with other nutrients and healthy fat. And the gelatin in this recipe will help your body’s joints, skin and overall gut health. To make these creamy, smooth gummies, simply make herbal tea (yes, you read that right! ), mix gelatin in and then blend with the other ingredients. Make a big batch as these bite sized treats will last in the refrigerator for over 2 weeks. With this chocolate peanut butter mousse, you can satisfy your chocolate and peanut butter craving, without sacrificing your health! This ultimate comfort food sweet treat is so easy to make with just a few ingredients and a blender. Gelatin is the key ingredient for this dessert’s creamy texture, and you can eat this dessert as soon as you make it when it has a pudding-like consistency or once it’s been refrigerated for a firmer custardy treat. Either way, we know this will be a big hit! This healthy strawberry balsamic mousse is packed with SO much flavor, thanks to the addition of balsamic vinegar and organic freeze-dried strawberries. Part of the trick of making this treat is the gelatin which gives this mousse the creamy and luscious texture that you will love. The gelatin also provides a protein boost and other benefits, such as helping make your hair and nails stronger. It’s AIP friendly and a perfect dessert for family or friends. This luscious chocolate tart has two secret ingredients that help to thicken and give this dessert a delicious smooth texture! Both the tofu and gelatin blend right in without any taste, providing thickness and protein too! And did you know that adding gelatin into your recipes provides lots of health benefits, including giving you glowing skin and helping strengthen your bones and joints? This is a WOW dessert! This keto-lovers dessert is perfect for the holiday season! The key to this Pumpkin Pie Panna Cotta recipe is the gelatin which is mixed into almond or cashew milk. Mix with the other ingredients, refrigerate for a few hours, and your delicious creamy Pumpkin spiced dessert is good to go! Need a bite of chocolate after your meal to satisfy the craving for something sweet? Look no further that these delicious Keto chocolate orange truffles. These tasty truffles make the perfect guilt-free treat with only 15 calories a piece, and the added health benefits from the gelatin! Gelatin helps to give these truffles a creamy and rich texture, while also helping your gut and joint health. Plus they are keto friendly, low carb and sugar-free! So go ahead and enjoy these guilt free chocolate truffles. We bet you can’t just stop at one! This delicious and satisfying Cashew Coconut Collagen Yogurt can also be called your gut’s new best friend. With 11 grams of protein per serving, this yogurt can do wonders for your gut health thanks to both the collagen and Further Food Premium Gelatin. Even though it takes a bit of extra time to make, this recipe will not disappoint—thanks to its creamy, nutty taste. Mix it with berries or homemade sugar free granola for a delicious breakfast or snack. This cool and refreshing Strawberry Watermelon Slushee will really quench your thirst, and it’s a cinch to make! The gelatin in this treat gives it a slushee consistency, in addition to health benefits such as improved joint and gut health. The watermelon and strawberries in this drink are excellent sources of vitamin C and include the antioxidant lycopene, which is known to promote heart health and help prevent certain cancers. Just mix all the ingredients in a blender and in just a minute or two, you will have a refreshing and nourishing drink. At 130 calories and taking less than 30 minutes from start to finish, these gluten free and keto friendly cheesy biscuits are divine! They contain only 4g of carbohydrates (2g of which are fiber) and they will not spike your blood sugar like many other white flour biscuit options. The best part of the biscuits is not only the cheesy flavor, but the added gelatin that helps with texture while providing health benefits to your entire body. Serve with butter or enjoy these cheesy biscuits by themselves. Either way, we think this recipe is a keeper! This gelatin egg is a total game changer! You may have heard of flax eggs or chia eggs, but have you ever tried making a gelatin “egg” replacement? All it takes is plain gelatin with some warm water, and after a few minutes, your gelatin “egg” will be ready to go. Use this is as an egg replacement in your baked goods. With this recipe, as well as all your other gelatin recipes, it is important to make sure you are using the highest quality gelatin made from grass fed beef, like Further Food Premium Gelatin. If you’re dairy free, this is the dessert you’ve been waiting for! This “healthified” keto dairy-free cheesecake is so good it will trick you into thinking you’re actually having dairy! The gelatin, which we know has a variety of health benefits, acts as a natural binding agent and thickener in this treat to give it that spectacular cheesecake texture. Prep time for this delicious dessert, including the almond crust, is just 8 minutes. Then chill in the fridge, and a few hours later, enjoy this rich and smooth cheesecake! Start incorporating Gelatin into your routine with Further Food Premium Gelatin!